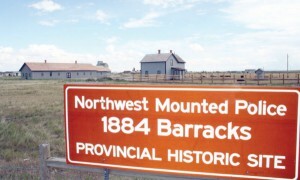 The 1884 North West Mounted Police barracks provincial historic site is being reconstructed. winter hit, selecting an island in the Oldman River. out of danger of flooding in the Oldman River. Artifacts, dioramas, photographs and other displays continue to tell the story of all that is important to southern Alberta’s history, from the Mounties to the First Nations people. 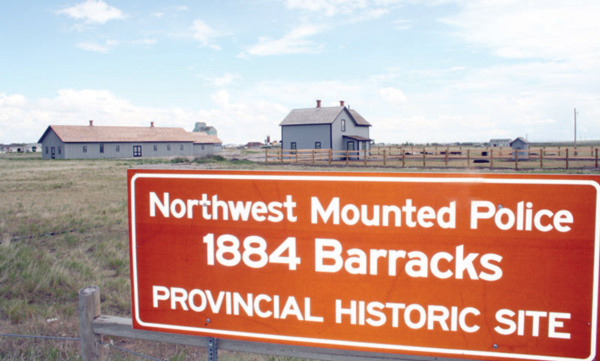 Dioramas of the original fort, barracks site and Head-Smashed-In Buffalo Jump are on display. For more than 40 years the museum has featured a Musical Ride by riders dressed in replica uniforms performing at 10 a.m., 11:30 a.m., 2 p.m. and 3:30 p.m. through July and August. Visitors have a chance this summer to develop a closer relationship with the Mounted Patrol and its Musical Ride through the Red Serge VIP Horse Program. Visitors can purchase a pass to help one of the riders groom their horse for the Musical Ride performance. They will help groom, saddle and bridle the horse, learn the secret of how the maple leaf is put on the horses, and do the inspection of the troop.